If you're thinking about buying or leasing a new Chevrolet car, truck or SUV, you're probably wondering what features come with the Chevrolet MyLink® infotainment system. When that happens, come to the Yemm Auto Group! Our Chevy dealership in Galesburg, IL, has plenty of new Chevy vehicles for sale that feature Chevy MyLink® technology. Just ask a member of our Chevy sales team to test-drive one and come experience the outstanding capabilities of Chevy MyLink® for yourself. Once you do, we know you'll be ready to finance a Chevy! The Chevrolet MyLink® infotainment system* takes what's possible on your phone and transfers that capability to your car. When you sync your compatible smartphone to your new Chevy through Apple CarPlay™ or Android Auto™, you'll see all your favorite music, apps, podcasts, and navigation appear on your car's built-in touch-screen. You can arrange your entertainment options in any order you like, making it easy to access everything you need safely and efficiently on the go. And once your phone is connected, you can send texts, shuffle between songs and make and receive phone calls all without ever having to take your hands off the wheel with Siri® Eyes Free. 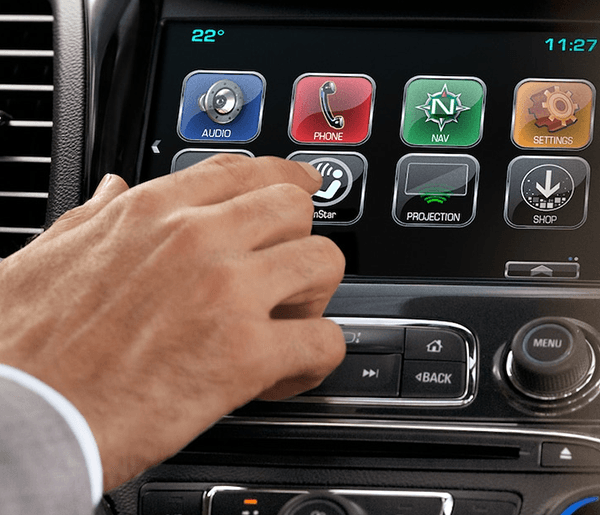 Can I Add Apps to My Chevy MyLink® Infotainment System? Sure, you can! Chevy MyLink® technology allows you to add a variety of Chevy MyLink® apps. If you want to enjoy hours of commercial-free music, add the SiriusXM® Satellite Radio app. Or, select Pandora® Internet Radio and like songs as you go. If you enjoy podcasts more, you'll love the Stitcher for Podcasts™ app that comes with over 100,000 podcasts and radio shows. You can also add SiriusXM® Travel Link and receive real-time traffic, fuel and weather updates. Plus, with the OnStar® Turn-by-Turn Navigation app, you can discover new places on a whim! Once you know the power of Chevrolet MyLink®, you know a better drive awaits. Contact Yemm Auto Group with any questions about how Chevrolet MyLink® works or how you can add apps to your Chevy MyLink® infotainment system, and we look forward to helping you buy or lease a new Chevy soon!